You may recall this list of house projects I set out to complete shortly after moving into my home in December 2009. The hubby and I have made lots of progress, but the list seems to just keep growing. 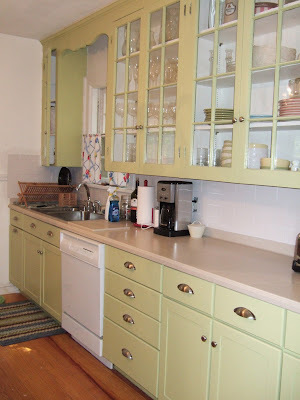 This past weekend I completed a huge project that I had been dreading, painting the kitchen cabinets. 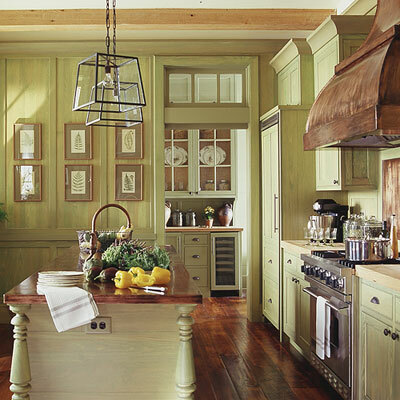 I simply love the look of painted cabinets.﻿﻿﻿﻿﻿﻿﻿.. I simply can't stand painting cabinets... but, its amazing how paint can brighten and freshen up a dated or dark kitchen for next to nothing. 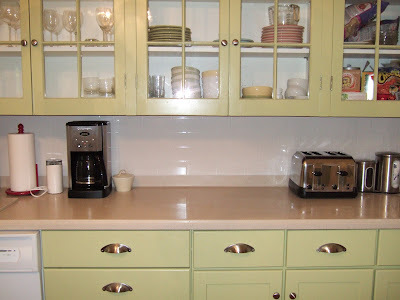 I painted the cabinets in our last house too (also a 1940's house). That kitchen was pretty big and bright (for an old house) so I selected a vintage green color. See all of those glass doors and the white interiors behind the glass? Not fun. I also once helped a friend paint her cabinets, so this time I felt like I knew what I was doing. The kitchen in my current home had dark cabinets, dark granite tile, and one window. 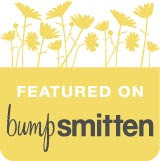 I decided to go light, and choose an off white color called Swiss Coffee (Benjamin Moore). Twenty-one cabinet doors and eight drawers later, it is done. In addition to painting the cabinets, we also replaced the cabinet hardware (for $33), painted the walls (Benjamin Moore Ashley Grey), replaced the fan hood above the stove with a microwave/fan, added a valance above the window, and added antique rug (that we used in the foyer of our last home) to hide warm up the tile floor. You can't tell from the before pictures, but the walls were pink (to "compliment" the flecks of pink in the granite tile). 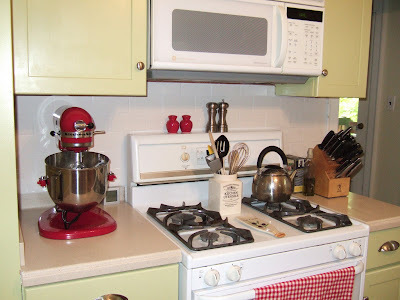 The new wall color and light cabinets tone down the pink in the granite. Thank goodness, as replacing the granite was not in the budget. I would like to replace the faucet and I have already started hinting to my family that this is what I would like for my birthday/Christmas (both in December). The Turkish rug that used to be in our foyer. This odd corner has a lot of dead space so I have filled it with small appliances that don't fit anywhere else. This is the cabinet you see when you enter the kitchen. I am thinking about hanging a picture or memo board here. Its hard to see, but the fabric fits the room perfectly. There are loads of cabinet painting tutorials out there so I'll spare you the play by play. I will leave with you with a few tips that I have learned along the way. Remove all cabinet doors and hardware before painting. This takes a while but the results will be worth it. I did cheat on the big pantry doors and they took twice as long as the other doors to paint. Clean everything with a good degreaser. Lightly sanding won't hurt but you can skip it if you use Zinsser Bulls Eye All Surface Primer. I have used this in the last two kitchens I painted and it works very well. Paint the back sides of your cabinets first. This way when you flip them in between coats, any imperfections as a result of the flipping won't be on the front side, as it will get the last coat. 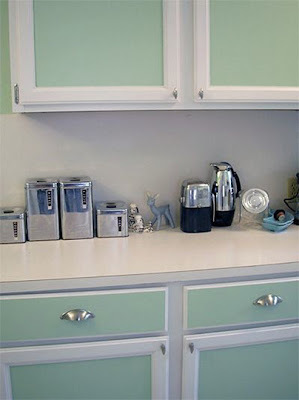 Lay cabinets flat to paint and prop them up with cups or cans. That way you'll be able to paint the sides and keep an eye on drips (which will form). Do not let family members help, that way the only person to blame for imperfections will be you. Be prepared to spend a lot of time on this project. You have to wait for coats to dry, it will take multiple coats, and unless you have a huge indoor space to lay out all of your doors; you'll have to paint in phases. Use a good quality brush, not a roller, to apply primer. Be prepared to do some touch up work (there will be spots you missed) when you hang the cabinet doors back up. I was a little nervous about the dark gray on the walls, but I love the contrast. Looks like a brand new kitchen and no more pink walls. 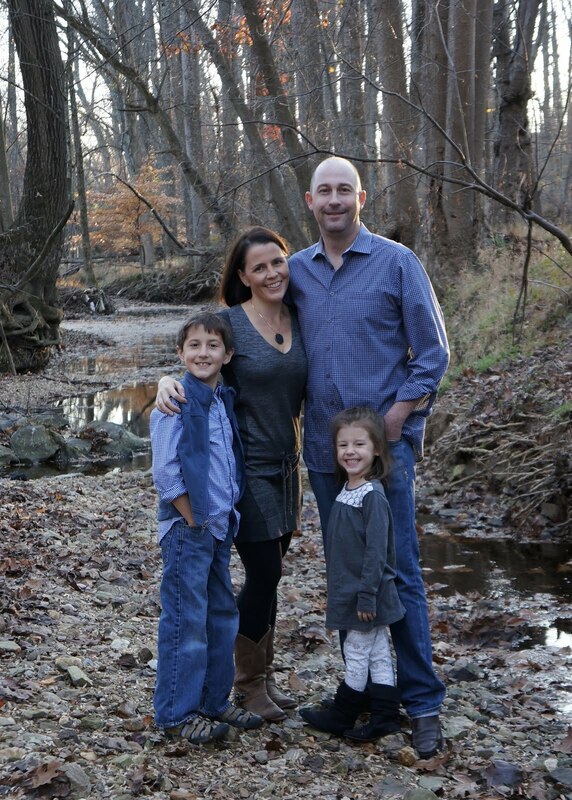 Terrific job Amanda,it is an amazing change. Kitchen looks great, Amanda! 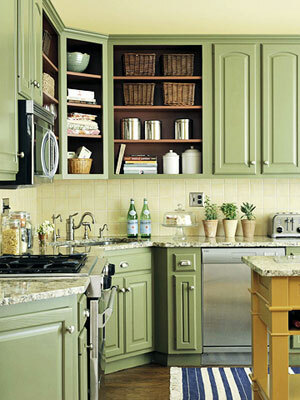 Gives me motivation to get my cabinets painted (golden oak, which I hate). Good job!